As I’ve already explained, Theresa’s stitch-up could trap us in the EU forever and prevent Britain making any trade deals with non-EU countries. Or, if we ever want to leave the EU, every single EU country can demand massive concessions from us by threatening to use its veto. Spain can demand we hand back Gibraltar, other countries can demand full access to UK fishing waters, the EU could demand the UK raises its VAT and corporate tax rates so we can’t compete with EU countries and so on and so on. And, if we sign treacherous Theresa’s sell-out, we’re totally powerless in the face of any demands EU countries make. 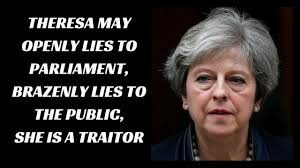 May’s excuse for a government is frantically trying to suppress its own legal advice, that we taxpayers have paid for, so that MPs, the press and voters can’t find out what a disaster May’s ‘deal’ is. The dishonesty of our rulers is astonishing. Have they no shame? 9 comments to Lying scumbag May – have you no shame? Yes Sir David Attenborough should know better, do you remember David Bellamy he is not so easily duped, Maybe David Attenborough is now senile, has he been taking the Flu Vaccine,its known to cause Dementia with all that Aluminium and Mercury and dead Fetus parts in it. Even Piers Corbyn ,Commie Jeremys brother has it right..
Its all about the MONEY, Carbon Credits Scam for the Banksters of course. This is excellent I recommend Sir David Attenborough watch it now. 10 and 11 December UN meets in Marrakech then we are doomed. The day after tomorrow Africa packs its bags and sets off for the UK. the land of the Magical Money Tree a sort of Golden Fleece Myth but is really just mountains of debt. As Mrs Thatcher said Socialism is Great till you run out of OPM other peoples Money. It doesn’t include Pensions and unfunded liabilites but they will never be paid out anyway. The Day after Tomorrow it will be a Criminal Offence to criticise the Mass Immigration into the UK from Africa. ALL PART OF THE NEW WORLD ORDER PLAN WELL THAT SHIP HAS SUNK WE NOW ALL KNOW THE TRUTH IT’S ALL THESE NON-CHRISTIANS HAVING MULTI WIVES AND ARMIES OF KIDS ..SO ******* ******* **** ****** *******!!! This is a better link to the anti-UN Compact-signing protest than the one I posted late yesterday. I note signatures are up from 75,000 yesterday evening to almost 92,000 now, so at least some people are waking up! It is all going to plan. Cameron walks away singing and nobody says a word about his broken promise to implement the referendum result whatever it was. This saved him being embarrassed by doing something he never expected to happen. 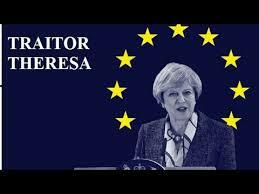 In came Remainer May who has deliberately made such a mess of everything that the establishment objective of staying in the EU will be the only way left open. So ends democracy in the UK. We will fit well in the undemocratic EU. A Thorpe – that’s exactly it, the plan is on course.